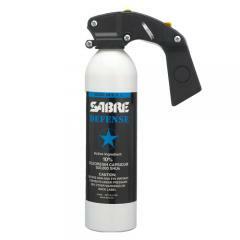 The Sabre Defense MK-9 DPS 18.5 oz Fog Delivery Spray is a powerful method of non-lethal law enforcement. Between its potent formula and fog delivery system, the MK-9 is ideal for calming and controlling rioting crowds. Featuring a 10% OC concentration with .33% major capsaicinoids, the formula provides the strength needed to stop the most aggressive attackers. The formula immediately inflames the sensitive membranes of the eyes, nose, lungs and throat, causing crippling disorientation and immobilization. A unique dual propellant system combines Dupont's Dymel134a propellant with nitrogen gas delivers a more concentrated and reliable spray than traditional models. The canister's high volume nozzle provides dense fog spray that offers maximum area coverage.